Head out into the wilderness on an adventure in search of the elusive Big Foot in hopes of receiving one of his Out of the Blue bonuses. Take note when you sight him along the way as you attempt to make it onto the progressive scatter trail. Plus, up the ante by utilizing the Big Bet feature! The Legend of Big Foot is a 5 reel, 10 to 20 payline Barcrest slot centred on the mythical creature. Big Foot usually appears in the main game randomly and activates a mini feature. There are 5 in total with the best including reels that turn fully wild. The slot also includes a Free Spins feature which starts off with 8 free spins and 2 random wild symbols on every spin. As you go, you get to advance levels giving you access to more spins and random wilds. There's so much more to love here, keep reading to find out more. Stakes start from 10p to £300 a spin on all mobile, tablet and smartphone devices. If you place a bet at £2 or under, you play with 10 lines, while if it's over £2, you play with 20 paylines. The Legend of Big Foot is set in the wilderness. Symbols on the reels include playing cards K, Q, A and J and animals like mountain lions, eagles, wolves, badgers, skunks and buffalo. The wolves pay the best value of 30x your bet when 5 land on a payline. Big Foot acts as the wild and replaces all the other symbols except the Big Foot footprint scatter symbol. In the main game, Big Foot can hit the reels randomly and activate 1 of 5 mini features offering symbol swaps, extra wilds, free spins, wild reels and more. Free Spins feature -If you don’t manage to trigger the spins groom the base game features, you can still do it by landing the scatter symbol on the odd numbered reels only. You'll start off at level 1 with 8 free spins. On each free spin, 2 symbols will be randomly replaced with wild symbols. Big Foot scatters will add to the trail of free spins above the reels. 3 of these scatters can elevate you to the next level. The higher you go the less free spins, but the more random wilds on each spin. Big Bet feature -This feature involves a series of 5 linked spins that are played on 20 paylines. Placing a higher stake will give you access to extra features e.g. more base game mini features, double-height scatters and more Big Foot sightings. The double-height scatters increase the likelihood of activating the Free Spins feature in the main game and advancing the Free Spins levels. Barcrest has had a long history in the iGaming business. They had their start in the UK back in 1968. At a certain point in time, all the slots in British pubs and casinos were manufactured by Barcrest. Barcrest dominated the market during the 70’s to 90’s. The company is now owned by Scientific Games, who bought it in 2011. 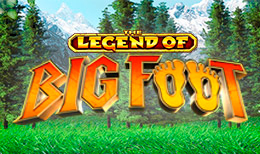 The Legend of Big Spins online slot may not have a lot going for it in terms of graphics, but that's not what Barcrest wanted you to focus on. The Free Spins feature is definitely the most rewarding if spinners can manage to advance through the levels. If you’re lucky, you’ll be able to win up to 7 wild symbols on every free spin! The Big Foot Wild Reels feature can be especially lucrative. The slot has a medium variance.